Roger Clayden, cello, and Christopher Taylor, piano, return to play Brahms’ Cello Sonata in E Minor Op 38, Elgar’s Chanson de Martin, Salut d’amour, JS Bach’s Air in G and Ave Maria. The Trombone Trio play Blake Kiely and Flynn Jeffery. 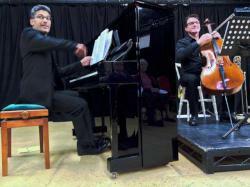 Clayden will also play a short selection of famous classical works.